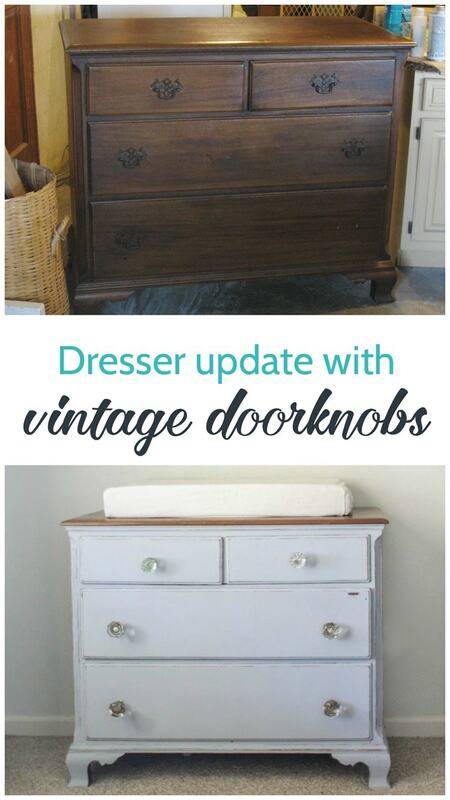 Dresser Update with Vintage Door Knobs - Lovely Etc. I’ve shared pictures of this little painted dresser in our nursery several times, but I don’t think I have ever really shared its whole story. 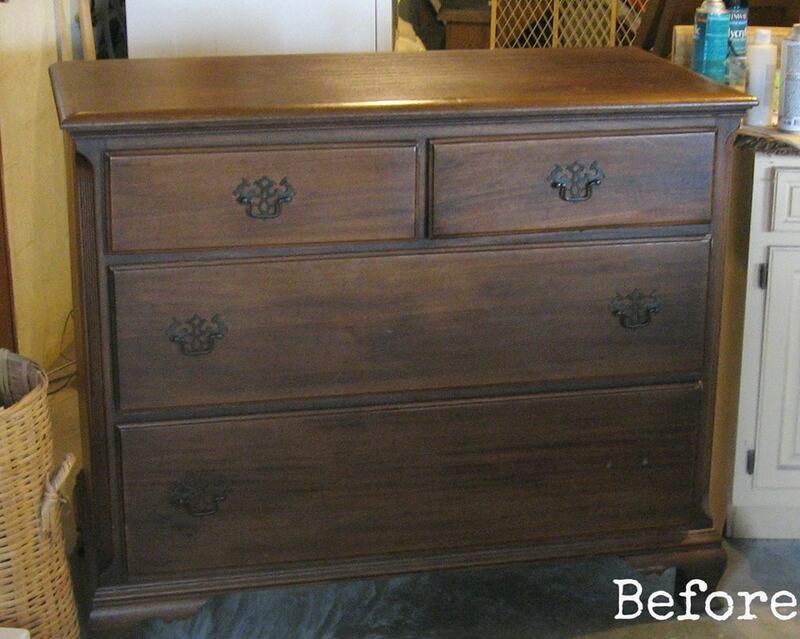 This dresser was a freebie that a fellow furniture lover passed on to me several years ago. I just love the cute shape and proportions and it happens to be the perfect height for a changing table. And because I was able to score this little dresser for free and the doorknobs were a steal at a yard sale, the entire transformation cost me less than $20! 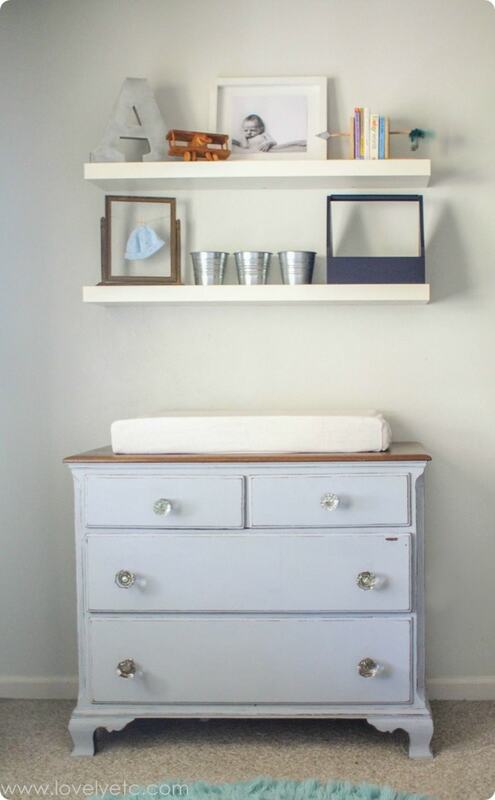 This dresser was actually pretty cute to begin with, but I knew some fresh paint and hardware would really freshen it up. The real pizazz came from the hardware. A few years ago I stumbled up on a bucket full of old glass doorknobs at a yard sale in my neighborhood. They weren’t marked with a price and I had no idea what I was going to use them for, but I figured it wouldn’t hurt to ask how much they were. Ten bucks! For the entire bucket! You’d better believe I snatched them up in a hurry. It just goes to show you never know what you will find at yard sales. When this little dresser project came along, it seemed like the perfect time to pull them out. 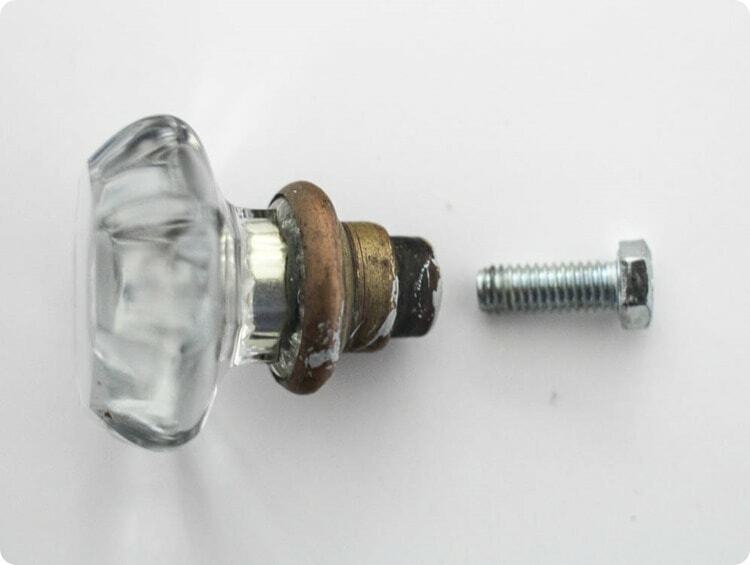 Of course, if you are looking for your own glass doorknobs and don’t have time to search for them at yard sales and flea markets, these glass door knobs from Amazon are nice and are pretty inexpensive. Doorknobs don’t work quite the same way as typical drawer pulls, so I had to get a little bit creative to make these work. Truthfully though, the whole thing was way easier than I expected. I chose six similar glass doorknobs from my stash. Some old doorknobs have small square holes but mine each had a round threaded hole. That made finding appropriate hardware to attach them much easier! Since each of my doorknobs was different, I hauled the whole set to the hardware store to figure out what I needed. I ended up needing several different sizes of bolts. (Vintage hardware doesn’t exactly come in standard sizes). I went with two inch hex bolts in each of the necessary diameters. I measured each drawer to find the correct position for the knob and then drilled a hole for the new hardware, making each hole slightly larger than the hex bolt that would be going through it. It needed to be big enough for the bolt to slip through the hole but not so large the knob would be wobbly. 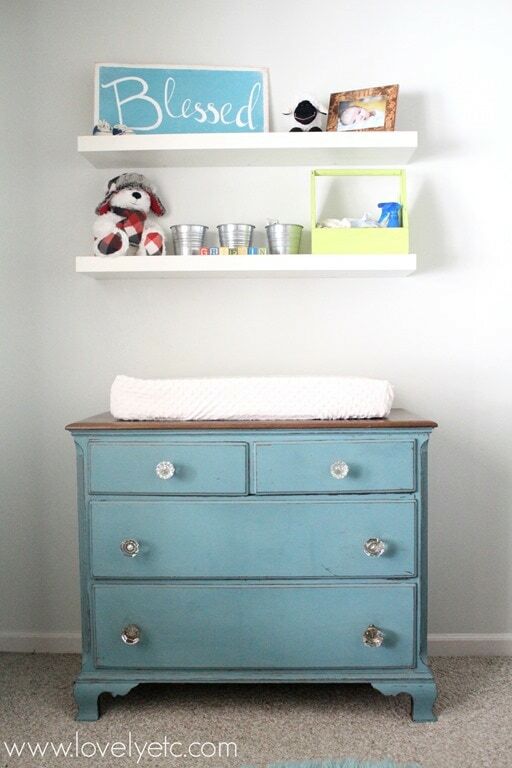 This little dresser was the perfect piece for Griffin’s nursery. So when it was time to move Griffin to his big by room and update the nursery for baby Asher, I knew this dresser was staying. It just needed a fresh color to work in the new nursery. This time I used DecoArt Americana Décor Chalky Finish paint in Yesteryear which a nice, mellow gray. The thing I love most about chalk paints is how quick and easy it is to paint something without all of the extra prep. I just wiped down the dresser to make sure it was clean and then painted on two coats of the new color. I sanded the edges again and then followed that up with DecoArt’s matte varnish as a sealer and it had a whole new look! Pretty cute for a $20 dresser if you ask me! Ready to see more thrifty decorating? 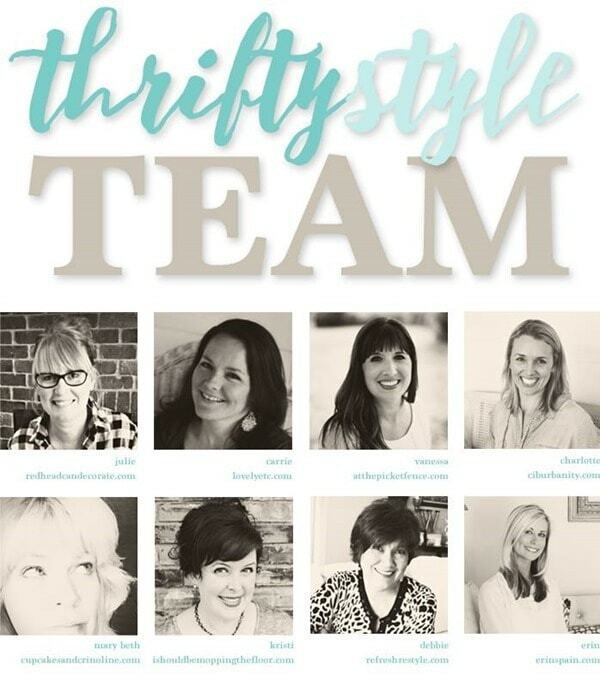 You’re going to want to check out these awesome thrifty ideas from the rest of the thrifty style team! Oh I just love it!! You gave it a whole new life and those knobs are fantastic! Thank you so much Vanessa! They were definitely one of my best finds! You did an amazing job. Your beautiful makeover looks nothing like the original! You did a great job in transforming the dresser, but I think I preferred the original handles – but cleaned up and polished. More dramatic against the white paint of the dresser. But that’s just my opinion. 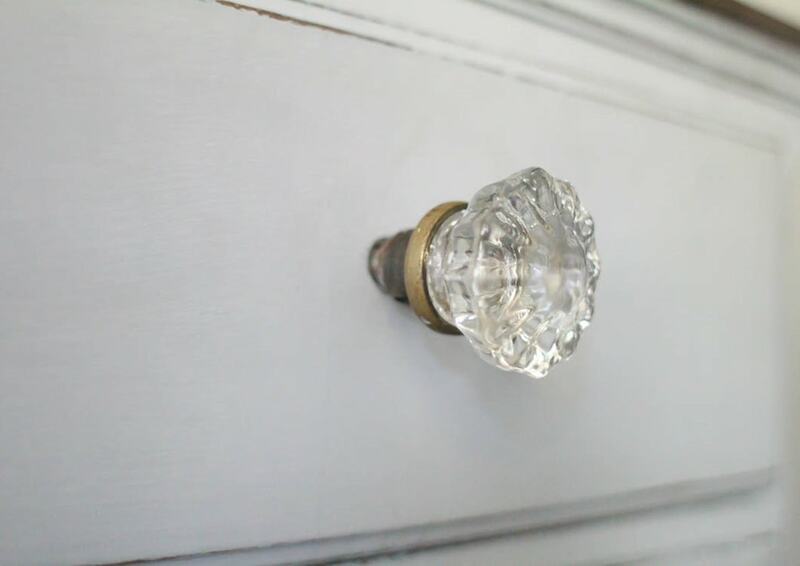 I have similar glass doorknobs on all the doors to the bedrooms in my 100-year-old house – they were original to the house and I have to say, they look good. Thanks Stefanie. I love the doorknobs, but you are right, the original knobs could have looked nice as well. 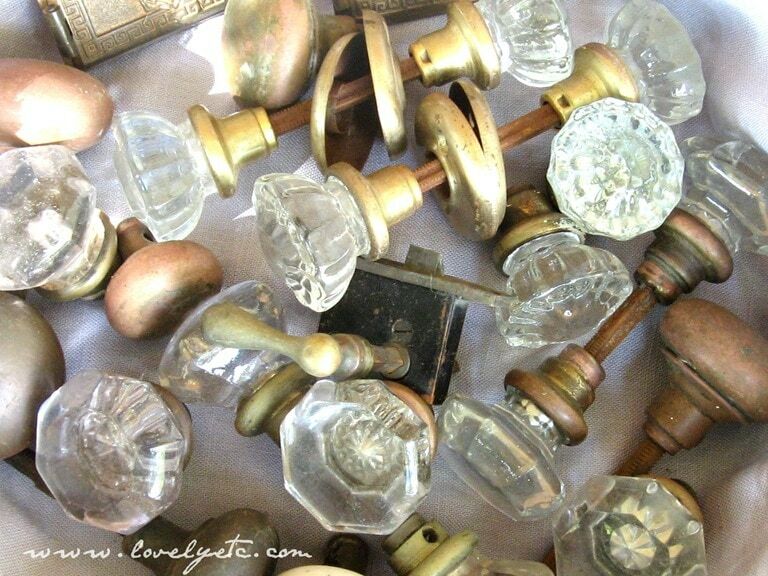 I bet your doorknobs look beautiful! Beautiful transformation! I love the distress look too so I pretty much distress everything I make or update. What a score on the door knobs. Would love to run across a great buy on door knobs. Thank you Linda! Those knobs really were a steal! And I love the distressed look too – also, it really works well around my kids lol. Hope it gets another reincarnation as the kids get older.